Recently, The Quaterfinal Draw Of The 2018/2019 UCL Season Was Drawn And It Brought Lot Of Surprises. The Surprise Or Biggest Match Of The Round Sees English High Flyers, Manchester United Facing Laliga Defending Champion, Barcelona In This Round Of Fixture. Man Utd Defeated French Champion Paris Saint Germain (PSG) In The Previous Round, While F.C Barcelona Showed There Ruthlessness By Defeating French Side Olympique Lyonnais By Five Goals To One On Aggregate. This Fixture Is Promising To Be A Very Mouthwatering Tie, Looking At The League Form And Positions Of Both Teams Involved,it Looks Like A Warfare Between David And Goliath. But With The Resurgence Of Man Utd As A Result Of There Top 4 Pursuit , It Seems Like A match Full Of Unpredictability. Though Many Pundit & Football Stakeholders Predict Doom For Man Utd. But With The Way Things Have Been In Recent Times For Man Utd,their Interim Manager Ole Gunnar Solkjaer Gave Fans The Reason To Dream Again Which He Exhibited In The Miraculous Fashion He Eliminated Paris Saint Germain To Book A Last 8 Ticket. As A Matter Of Fact The English Side Has A Good Record In Two Legged Ties Against The Spanish Side Barcelona. But Will Theatre Of Dreams Live To Dream Again? 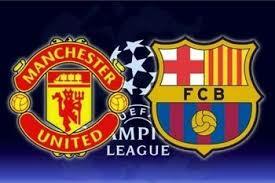 Or It Will Be Doom For The Red Devils Against The Messi Inspired Barcelona Side.